Most decayed sacs come out of the pen without any difficulty. Often, the sac is virtually whole, though ossified, and falls out of the barrel. Mostly, the sac has disintegrated into flakes and again, can be knocked out of the barrel. There are those, though, that have assumed the consistency of very tough chewing gum. It refuses to let go and if it moves at all, it goes deeper into the barrel. That’s where these handy forceps come in. They’re remarkably cheap and worth their weight in gold! which, because they have a range of shapes, will, with persistence, get every last bit of sac. They’re sold either as dental picks or as modelling tools and, again, they’re inexpensive. 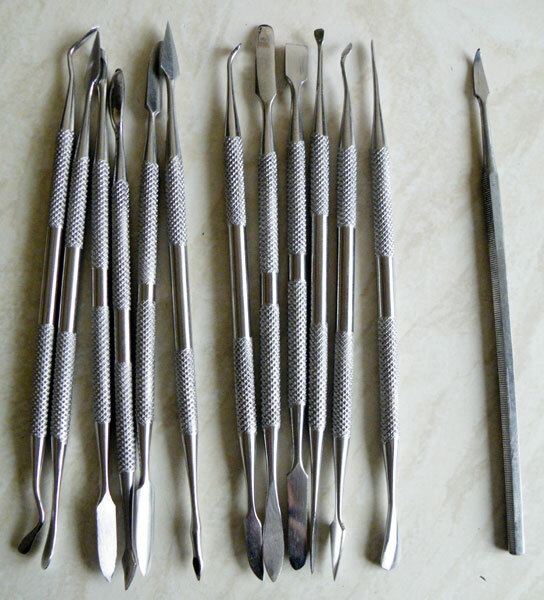 The one on the right is a standard dental pick. These have a secondary use: because they come in a variety of shapes, they can be very useful in helping to burnish bent nibs back into shape.